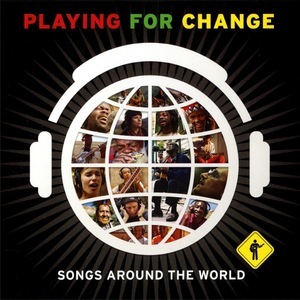 Posted on Sat, Feb 18, 2012 : 5:33 a.m.
“Playing for Change” began humbly—and by accident—in 2004, when record producer Mark Johnson heard street performer Roger Ridley singing a stirring, soulful rendition of Ben E. King’s R&B classic “Stand by Me” in Santa Monica, Calif.
That experience lit a fuse under Johnson, and set him on a mission: He and a sound crew and camera crew traveled around the world, recording other street musicians in nations like Nepal, Spain, India, the Congo, South Africa, Venezuela, the Netherlands, Zimbabwe, Argentina and the U.S, among others. That trek yielded the 2008 documentary, “Playing for Change: Peace Through Music” and the subsequent “Songs Around the World” CD and tour. One clip from the film, featuring a multi-cultural version of “Stand By Me,” went mega-viral, being viewed by more than 38 million people worldwide. That song, like all the tracks on the disc (and in the documentary), was created by taking tapes of the many singers and musicians —from all over the world—and overdubbing them to create something new. Playing for Change became such a phenomenon that Johnson and the Playing for Change Foundation have kept the concept going. Johnson and a crew embarked on more globe-trotting in 2010-’11, which led to a second album, “PFC 2: Songs Around the World,” released last year, and the Back to Our Roots tour, which comes to The Ark on Wednesday. Who: A true “world-music” band consisting of musicians from many different nations and cultures. What: Songs about togetherness, redemption, connecting with others and other positive subjects, from the two “Songs Around the World” albums, plus some new songs. When: Wednesday, Feb. 22, 8 p.m.
How much: $35. Tickets available from The Ark box office (with no service charge); Michigan Union Ticket Office, 530 S. State St.; or Herb David Guitar Studio, 302 E. Liberty St.; or online from the MUTO. The latest disc and the current tour also include some core performers from the first go-round, including Grandpa Elliott (vocals and harmonica) of the U.S. and Clarence Milton Bekker (vocals) from The Netherlands. Other band members on tour are: Mermans Mosengo (vocals/guitar/percussion), Congo; Jason Tamba (vocals/guitar), Congo; Titi Tsira (vocals), South Africa; Peter Bunetta (drums), U.S.; Reggie McBride (bass), U.S.; Mohammed Alidu (percussion), Ghana; Renard Poche (lead guitar), U.S.; and Louis Mhlanga (flying guitar), Zimbabwe. The album also features performances by Baaba Maal, Keb’ Mo’ and Stephen Marley. Wheras the first project began close to home, the latest disc had a more distant starting point: Mali. “We wanted to experiment with the roots of the blues, and then adding different musicians by following the routes of the slave trade, which took the music to different places—Cuba, Jamaica, Brazil, New Orleans—where, of course, it evolved in different directions,” he notes. “We really wanted to include the Marley and Lennon songs, because the messages in those songs are so profound, and so universal,” says Johnson. “And we were thrilled when the estates of both of them gave us permission to use tape and footage of Bob and John singing those songs. “So, on both the album tracks and in the film (which has not yet been released) you can hear and see Bob singing ‘Redemption Song’ with the world, and hear and see John singing ‘Imagine’ with the world. The Playing for Change Foundation now has eight schools in five nations, the newest one in Kirina, Mali. “It’s a 1,000-year-old village, where they can trace 80 generations of musicians, and the school is owned and operated by the community,” says Johnson. “And now the foundation is working with NASA to help connect the schools together, online, so the students can interact and create together." More information on Playing For Change can be found on its website, www.PlayingForChange.com. Kevin Ransom is a freelance writer and critic who covers music for AnnArbor.com. He can be reached at KevinRansom10@aol.com.